Register NOW! and see how Leasedeposit can save you time, money, and take the risk out of rental property management. It's FREE! I used to print paper copies then scan them to keep a digital copy. Having Leasedeposit store the documents online is a great time saver. Super easy to use. It's great being able to capture invoice images in the expense tracking section. Signing the agreement online worked great. No going back to pen and paper! 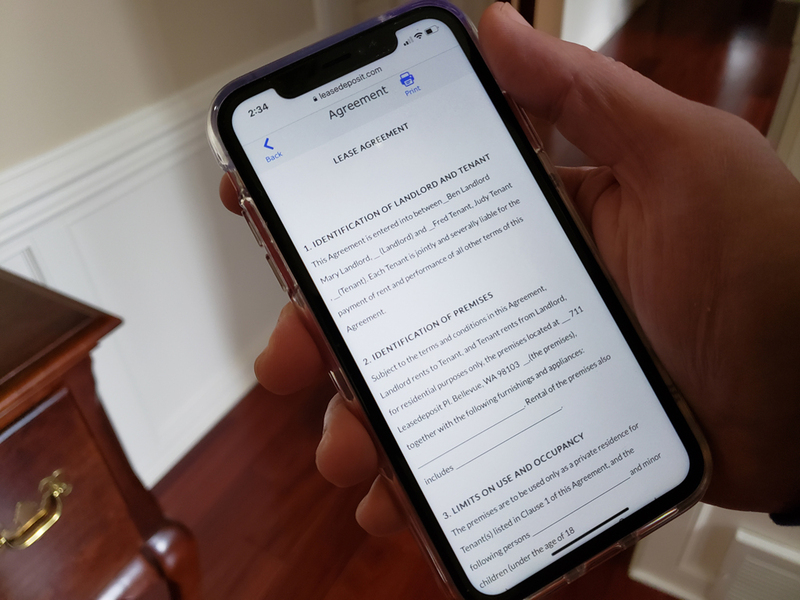 It’s great to be able to sign the inspection report on my phone after the inspection. Leasedeposit comes with a lease agreement template with clauses common to property rentals in US and Canada. To simplify the lease agreement creation process over time, you can modify the template to suit your needs. For example, if you require renters insurance, or maintain a certain pet policy, you can specify these in the template so future lease agreements will include these conditions. Leasedeposit provides a simple user interface to capture lease agreement information (e.g., property addresses, tenant information, and lease terms). The information you provide is stored securely in the cloud for easy access at any time on any device. 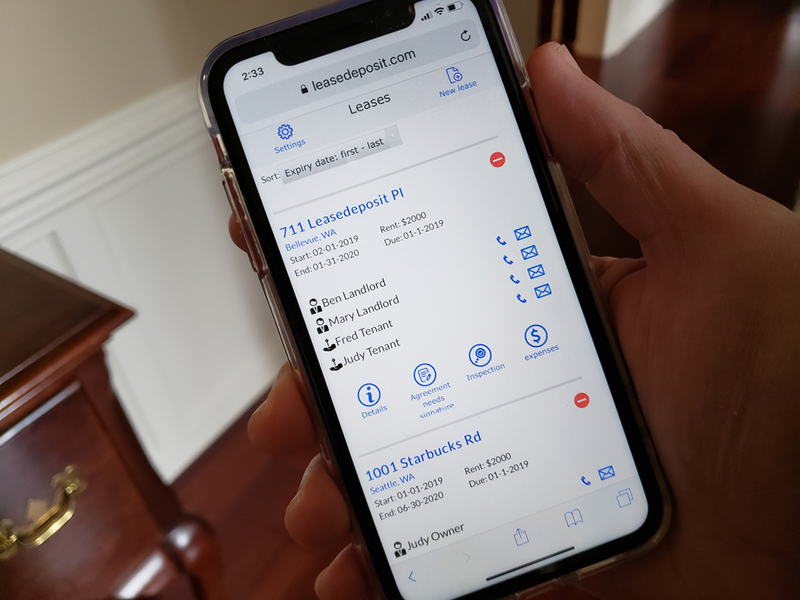 Whether you want to contact a tenant, determine when a lease expires, or confirm when rent is due, it’s all accessible anytime, anywhere on your device. A detailed, accurate, and signed inspection report is critical to reducing the risk of property damage by tenants. 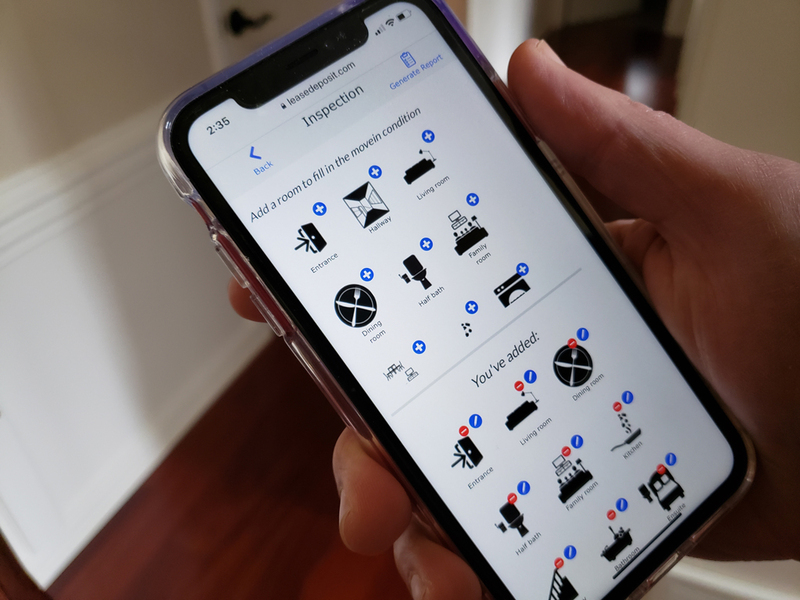 Leasedeposit makes it easy to create custom move-in and move-out inspection reports that can be signed on your mobile device after an inspection has been performed. During the inspection process, you add each room that you are inspecting, detailing area conditions as you move along. You can also take photos and notes to accurately capture the condition of each room. At the end of the move-in inspection, Leasedeposit creates a document that includes all entered information. In addition, the document contains a signature section, which enables you to capture the tenant’s signature after the inspection is complete. 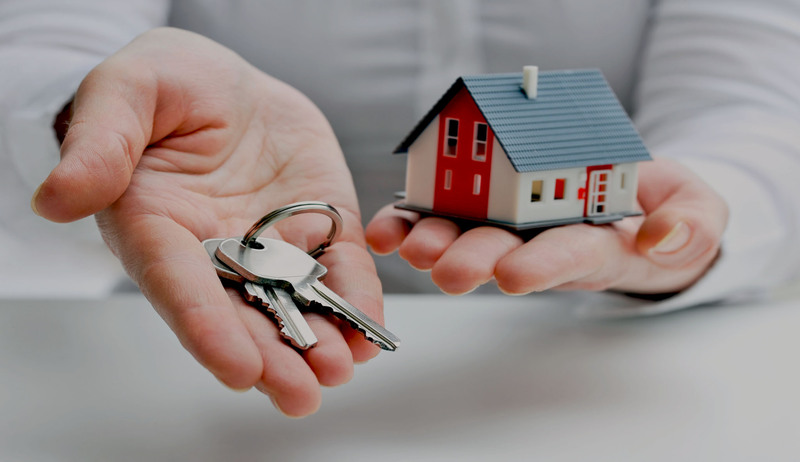 This reduces the risk of damage to the rental property, as tenants are more likely to take care of the property if they are aware of an accurate and detailed inspection report in place during the move-in process. 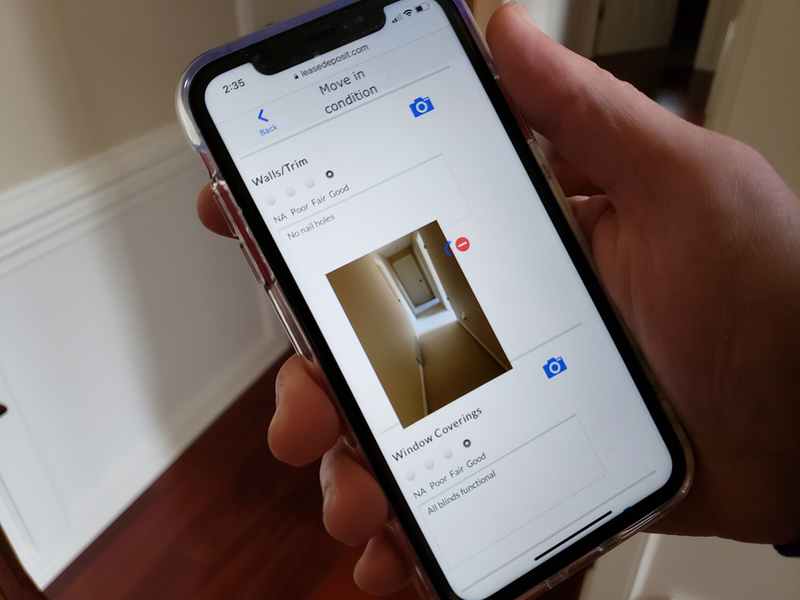 During the move-out inspection, you select the rooms you added during the move-in process and take photos and notes, as appropriate, to capture the move-out condition of the property. Once the move-out inspection is complete, Leasedeposit generates a document that includes both move-in and move-out condition information, including a signature section for your tenant to sign. In case of property damage, the detailed move-out inspection document generated by Leasedeposit can help you justify any security deposit deductions. Leasedeposit supports online signatures, which means you and your tenants can sign the lease agreement on your PC or phone and have it stored online. There is no need to print the document, mail physical copies around, coordinate a time to get signatures, or scan it to keep a digital copy. This saves you and your tenants precious time. The Leasedeposit process is simple. Once you are satisfied with a given lease agreement, Leasedeposit composes an email to the tenant with a link to the agreement. Your tenants can then sign the agreement on their device and use the button in the agreement to mail it back to you. After you have signed the agreement, Leasedeposit will compose an email back to the tenant with a link to the signed agreement. Furthermore, a copy is kept online, which can be accessed at any time. You can enter your expenses in Leasedeposit during the year and generate a report at any time. This can save you many hours during your tax return preparation. 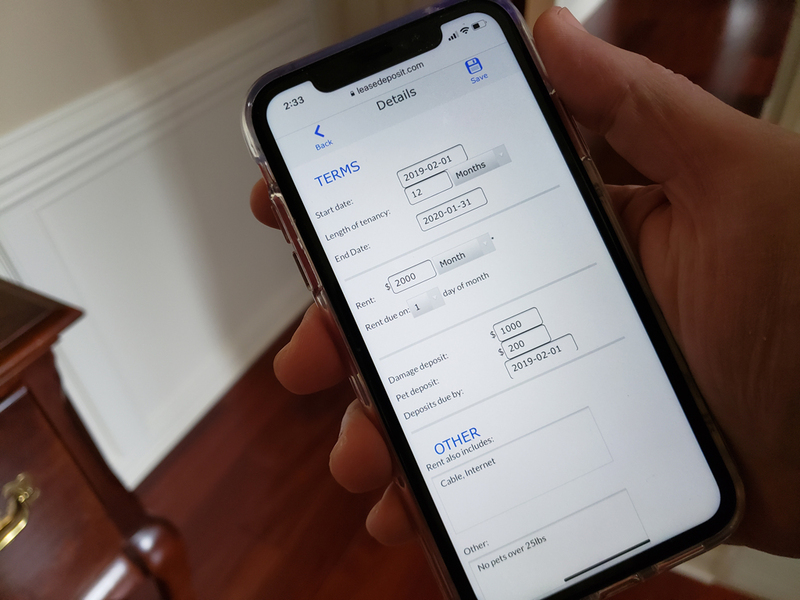 Often times, invoices are misplaced or discarded, which can be an issue if you are audited by the IRS or if you want to refer to old expenses for any reason (e.g., price comparison of a similar service in the future). 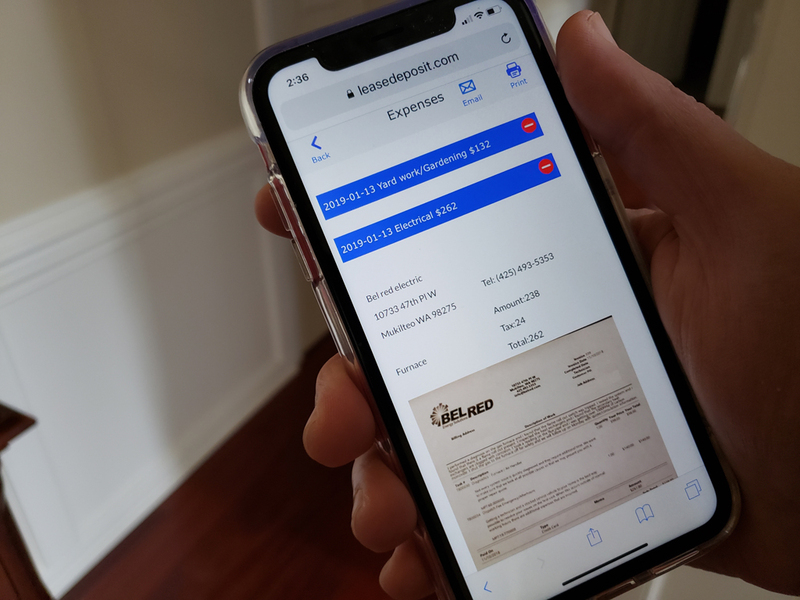 Leasedeposit allows you to capture an image of the invoice when the expense occurs so you can always respond to tax-related matters with confidence, or refer to old expenses for any reason.